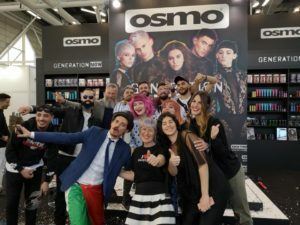 The 2019 Edition of Cosmoprof Bologna saw a record number of exhibitors with an increase of 10% from abroad, a total of 3033 companies from over 70 countries around the world. As the world’s leading trade fair for cosmetics and the professional beauty industry, Cosmoprof Worldwide Bologna brought together all sectors of the beauty industry from the start to finish – from sourcing raw material to the end product. For 2019 the show saw the fair split into 3 salons; specialising to specific sector types and distribution channels that are available to the public on different dates, allowing meetings with experts to potentialise business opportunities in the beauty world. The 2019 theme was sustainability, with a focus on the evolution towards sustaining the entire event and experience – with the exhibitors exploring similar initiatives. With the focus on the importance of moving in the direction of a new path for the cosmetics industry, Cosmoprof highlighted the importance on saving energy, recyclable goods and the correct use of environmental resources. With a new location for the Professional Beauty Systems stand, the location was in a new hall under the Great British Pavilion. With visitors from all sides of Hall 19 able to see the fresh new stand design in the premium location, this year was the biggest to date with new product launches across both the hair and beauty ranges. The show stopping stand attracted a large international audience, with new customers attracted by the brands strong imagery and large product offering. Many existing customers visited and were excited to see the new products that were launched at the show. With the largest launch to date, new additions to the Professional Beauty Systems portfolio proved popular with customers old and new; including flagship brand CRAZY COLOR® Hype Pure Pigment System, a breakthrough colour innovation designed to create endless colour combinations. For colour, care and styling the launch of the new Hype range created a buzz as a colouring product that can be personalised in an incredible variety of hair products and services, in salon and at home. Add to this – The Rainbow Cleanse Shampoo – that compliments the Rainbow Cleanse conditioner in the CRAZY COLOR® care collection, this new product is formulated to intensively revive hair colour whilst ensuring the pigments in the mixture remain perfectly unaltered. The OSMO® flagship brand continues to grow from strength to strength. With strong visuals, the OSMO® imagery drew a large audience and new products proved very popular, the OSMO® Super Silver No Yellow Mask and Shampoo in 30ml Sachet, and OSMO® Intensive Deep Repair Mask in 30ml Sachet which will support the existing products in the OSMO® range. OSMO® COLOUR REVIVE® and COLOR PSYCHO® Hair Colour ranges continue to push the boundaries of the hair colouring market. 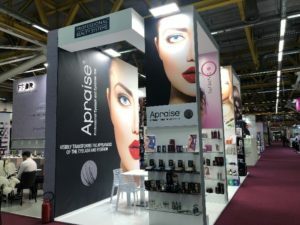 For the 2019 edition Professional Beauty Systems also saw new product launches across APRAISE® Eye Innovations, Skintruth® and KAESO® Skincare; Crazy Angel® Tanning. 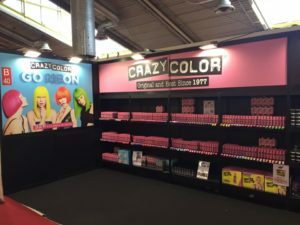 In conjunction with their Italian distributers Poker SLR Crazy Color® once again returned to Cosmoprof Bologna in 2019. Over 4 days team Poker and Crazy Color® joined together to introduce the Crazy Color® line to salon owners and stylists from across Europe. 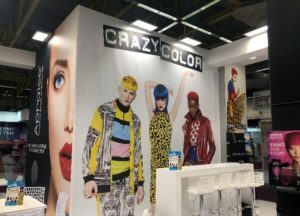 Following their launch at last year’s show the new product lines for Crazy Color® were also a huge success, the four Neon UV reactive semi-permanent colours, the addition of Graphite to the Spray In range and the Color Remover. For the third successful year running, OSMO® exhibited in Hall 25 in association with their Italian distributor POKER. 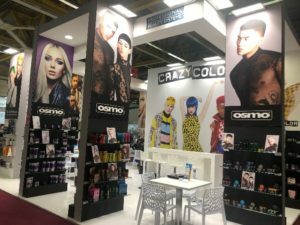 With an eye-catching stand featuring model imagery from OSMO® new Generation NOW campaign, OSMO® extensive range of haircare and styling products drew positive feedback from both new and existing customers. Particular interest was given to the Grooming lines and the ever popular Colour Revive and Color Psycho hair colour ranges. 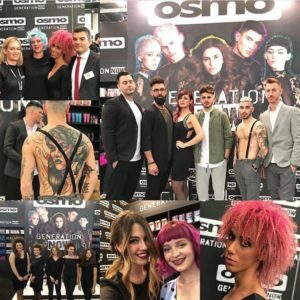 Live demonstrations took place on both the Sunday and Monday featuring some of Italy’s finest hairdressing and barbering talent showcasing their OSMO® results to great effect, from creative styling to dazzling bright shades on both male and female models using the OSMO® Color Psycho range. Dancers and singers also graced the live stage area to the delight of the crowd and created a fun, energetic and positive atmosphere for the duration of the show. Newly designed OSMO® goody bags were distributed to all customers who stopped by the stand featuring samples from the range and proved extremely popular.